Browse: Home » 2018 » August » 25 » Glimmers of Hope Amid the Worst Gold Miner Secular Bear Market in History? 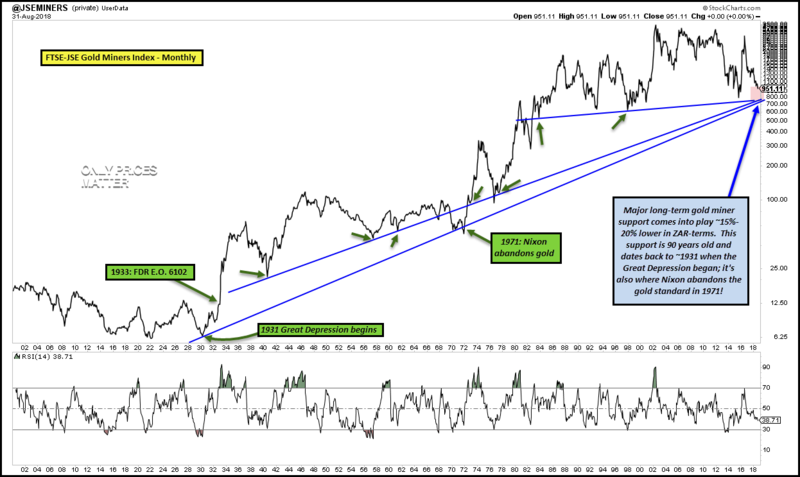 Glimmers of Hope Amid the Worst Gold Miner Secular Bear Market in History? Numerous items stand out on the analog above. The index’s price data originates in ZAR. If we take a look in those terms instead of USD, we similarly find that 90-yr support is somewhat lower than current levels, also about ~15%-20%. 2015/2016’s swing lows in miners saw us almost reach this support, but not quite, implying the need to do this moving forward before a durable low is in place. 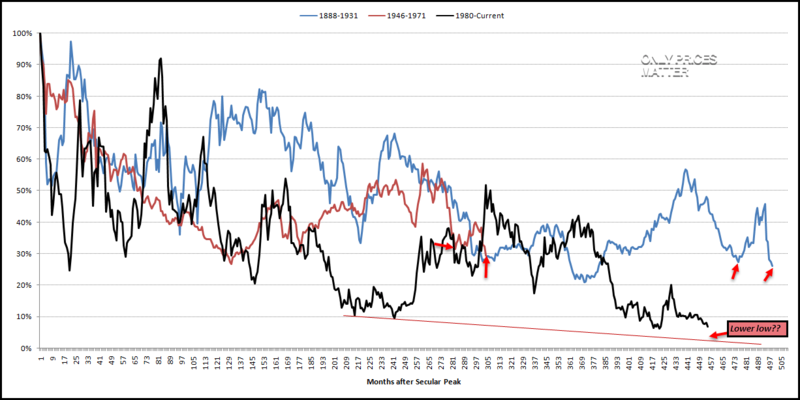 Even so, the support that’s coming into play is historic in nature and was created at the index’s 1931 secular lows as the Great Depression begins (followed two years later by FDR’s E.O. 6102 in 1933) and its 1971 secular lows as Nixon abandons the gold standard. Needless to say: massive secular bulls in miners – as well as huge shifts in the global monetary system – began at this support. To reiterate, the chart below is in ZAR terms (the fact that the index is down 93% in USD terms but far less in ZAR terms implies the likelihood for far greater appreciation in USD terms as the next “big” secular move in FX will likely be USD weakness, EM-FX strength). Perhaps the most important take away is that within ~three-four years of both the 1931 and 1971 lows in the index above, gold miners had risen by a factor of ~6x.